Flipping heck it’s been a while since I posted anything, let alone an edition of the Family Friendly Outings…I promise we have been taking the little Madam out! Adelyn recently learned how to say “sushi” so we figured we’d take her out to have her first taste and treat ourselves at the same time. Combined with a trot through Greenwich Park and a good old play in the playground – it was a lovely (albeit grey/windy) Sunday afternoon out. Ambience: Big square (some communal) style tables with comfy, cushioned and wide-backed supportive chairs for the grown-ups in a corner area at the front of the restaurant – window-side views to keep little ones occupied and shouting “BUS!” every so often. People with young families were seated in this section, and it was nice and chilled. No worrying about where to put your pram or your child dropping food on the floor – because other kiddos were doing the same! (Further back in the restaurant is the “grown-up” area nearer to the kitchen, with the harder, more style-inclined chairs). Facilities: Ladies & Gents loos down the stairs, very nicely appointed. Easily accessible and clean/spacious changing facilities located on the main restaurant floor. Standard wooden high-chair supplied. 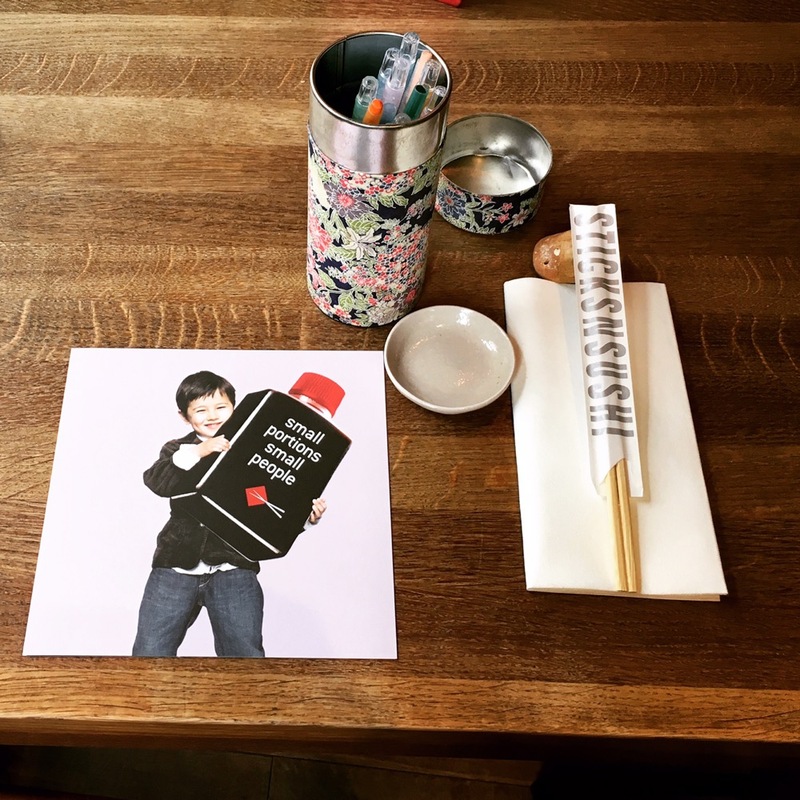 Children’s activities included in the menu and a tub of crayon-pens to keep little fingers occupied before the sticks n’ sushi-eating begins. Table was a little suspiciously sticky but nothing a good anti-bac wipe-down couldn’t handle – bonus of being a parent, you’ll never be caught without tissues/wet-wipes of some description. Food: Bit of something for everyone here really, a nice variety of meat on sticks and a great variety of both traditional (salmon and avocado) and non-traditional (salmon and cream cheese?!) sushi on offer. Impressed by the Children’s menu at about £7.50. 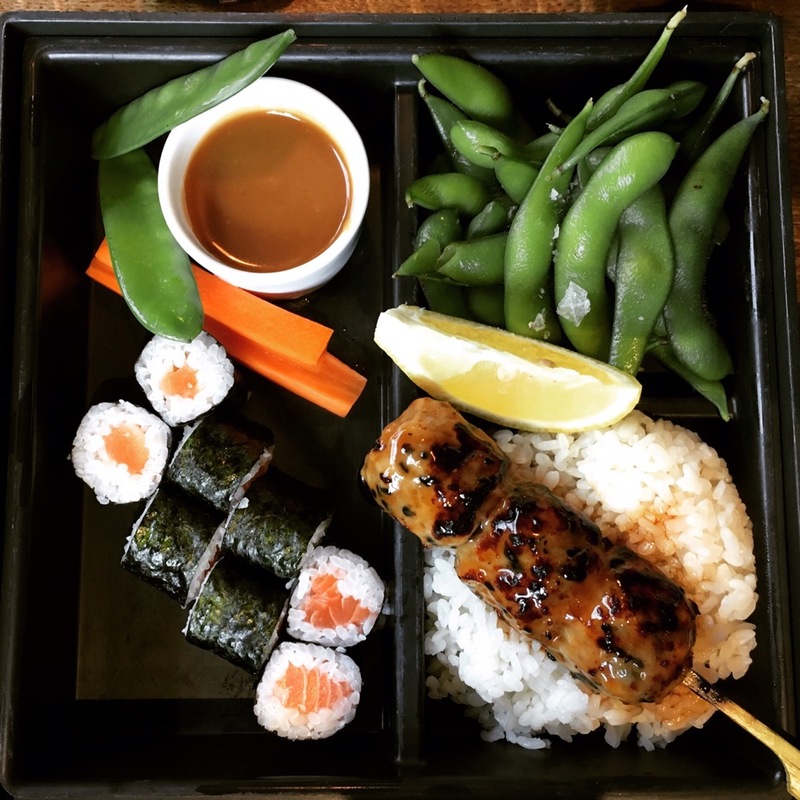 We went for the Chicken meatball skewer and salmon maki rolls (also came with choice of small drink and a little chocolate fish). Less impressed by the Hotate Kataifi (scallops served in a little crispy kataifi bowl), which at £10.80, we were expecting significantly bigger potions of scallop instead of what seemed like one scallop cut up into 6 pieces. Didn’t bother photographing it but in hindsight, wish I had to share the dismay! Enjoyed the Table for 2 sushi platter, which consisted of Nigiri: Salmon, tuna, shrimp, salmon New York (i.e. 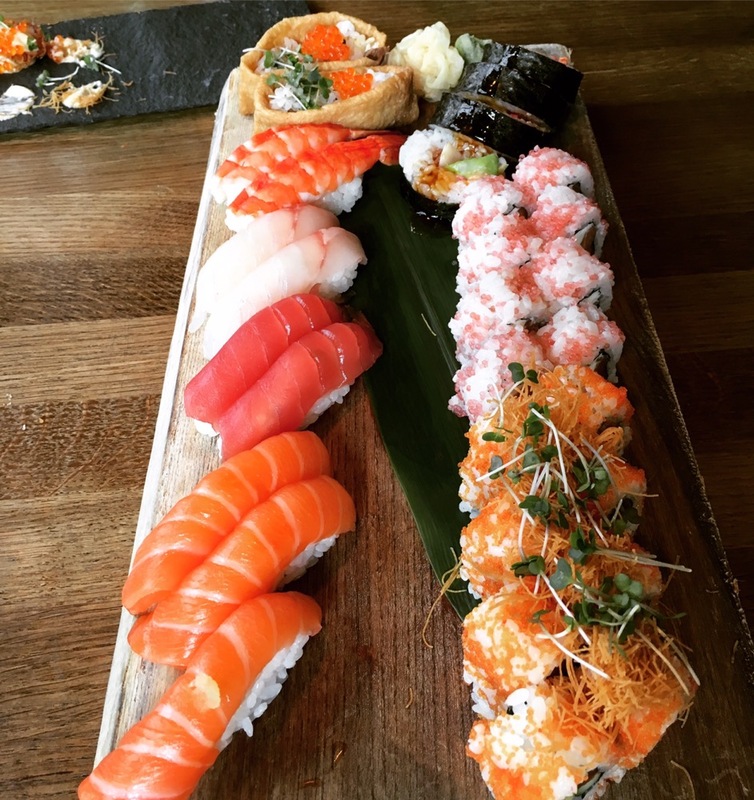 with a bit of minced garlic on top) inari and sea bass, Maki: Pink Alaska, spicy tuna and gypsy roll. Environment: This is the only Flat Iron I’ve been to and I hear it’s the biggest of the three locations. Beautiful frontage, with a window to have a nose at the Butcher butchering away and the ice cream counter at the front (more on that later). You can just about wheel a Bugaboo around in there, if you don’t mind being glared at by other patrons. They don’t take reservations though so if you’re hungry and heading there with a little one in tow, you might want to plan to get there shortly after midday to get a table. They’ll only seat you if all of your party are present too. High chair: your standard wooden high chair. Food: Ah the food – this is what you’re coming here for! My eyes are often bigger than my stomach – so when the flat iron steak was placed in front of me, I wilted a teensy bit if I’m perfectly honest BUT it was actually a great size to enjoy – as you’ll want to partake of the sides on offer and have space for that freebie ice cream at the end of your meal. Actually – looking at the photo, it looks substantial so perhaps I had my husband goggles on as I know he would want to demolish this x3. So the flat iron (US) steak, aka the butler’s (UK) or oyster blade (Aussie/Kiwi) steak – to be found in the shoulder. It’s a cheaper cut, thus the most excellent price point. Rich in flavour and delicious when eaten Medium/Medium-Rare (cooked any more and I expect your jaw would be in for a bit of a workout). The chips were crisp and more-ish – as you should well expect as they’re cooked in beef dripping! And I loved the creamed spinach over the aubergine. Went really well with the steak, as did my fave steak sauce – Peppercorn. At £10 for a flat iron steak, including a little pot of salad leaves – I’ve not felt the need to try the other cuts that they also have on offer yet. This is also the only branch that gives you a free ice cream cone at the end of your meal, just take your receipt to the counter on your way out and they’ll give you a scoop. Salt Caramel, dunked into dark chocolate shavings – oh my. There’s a whole history to it too – I believe historically there used to be a fella who would give out ice cream in this part of Covent Garden, so Flat Iron have honoured his generosity. Overall: I’m going to say this because I am one – there were a hilarious amount of Asians in there both times I’ve been. What can I say – we love good food at good prices! I’m a fan of Flat Iron – the service is friendly, even on New Years Day. The food comes quickly – perfect for is your infant is having one of those days. I wouldn’t place it as an immediately family friendly restaurant however, because of the no-hot-water thing. Also because you have mini cleavers on your table, so watch those tiny wandering hands if they’re within grabbing distance. If you have slightly older children though, the whole family will be able to enjoy an affordable steak, with free ice cream to boot – what a treat! *photo courtesy of my dear friend Lucy – because I have not gotten the quick snapping of food thing down yet mostly because I am hungry a lot of the time, as is Adelyn! Having celebrated Thanksgiving with my office last Thursday and with the logistical nightmare of Going Back To Work looming ahead – I’ve spent the weekend contemplating just how precious time has become and easy it is to take things for granted. Going out for some fresh air with our little family, being astonished by just how stunning the tree colours are and the pure joy of a frolicking pug on the loose really helped me to remember to take joy in the little things. I’m thankful for my beautiful family (both the one that we created and the one that created me), being able to put (delectable) food on the table and having a quirky, creaky home to fill with said family and food. Greenwich Park was one of our favourite places to take our dog for a walk when we lived nearby. Plenty of space to roam around, a great view of the Shard and Canary Wharf on the horizon, the Observatory, tennis courts if you’re that way inclined and a playground – something for everyone. There’s plenty of car parking spaces through the gates; it’s not the cheapest parking around but it sure is convenient. If you’re caught without coins, the machines take card also. You might also be glad to know that there are clean facilities on site, near to the park gates at the top. They can be quite nippy inside though! But after all of that walking comes the eating; there are a few places to eat within Greenwich Park itself but our go-to place is Greenwich Market’s food stalls. They’ve recently redone the roof for the covered market, and it’s looking particularly festive and bright for this time of year. For once, we agreed to share food so as to maximise our tastes of the meals! (Clockwise from top left) Roast Pork Banh Mi, Churros, Cuban Sandwich. I’m a big fan of Vietnamese food, mostly because it’s the only Asian cuisine that I’ve not tried my hand at before so I enjoy the novelty of having it. So we had to have a Banh Mi to start with – no mean feat with a hungry baby in the pram and an incredibly excitable pug in tow. Our solution when we’re out as a family is to stand on Coco’s leash, whilst one of us feeds Adelyn and the other scarpers down their portion! Next was the Cuban Sandwich – I have been curious about this since watching Chef – where I got to enjoy a bit of showmanship as the fella took a blowtorch to the cheese and it LIT UP. I did not know that cheese could catch on fire. Anyway – the bread was nice and crisp after a turn in the panini toaster and filling gloriously juicy inside- finger-lickingly messy to eat but hey I’m a mum so wet wipes and tissues are never far away. KS then wandered off, tantalised by the Pizza Pocket (not the US snack, eww), so I went for Churros. But not just a Churros – a churros filled with dulce de leche or chocolate. OR BOTH. It’s not cheap though at £2.50 a stick but eh it’s vegan and you’re helping out an independent food purveyor so why not! Yeah, we really needed the walk back through the park afterwards. The women in our family love a good Afternoon Tea. The whole aesthetic of being in a beautiful environment, dressed elegantly and nibbling at dainty food – it’s become something of a celebratory tradition and one that I fully intend to carry forward with my own daughter. The first time I felt Adelyn kick, whilst I was 5 months pregnant, was during Afternoon Tea with my aunts, Grandma and Mum – and after our experience at Sketch, I’m pretty sure she’ll happily join me in future. Environment – stunning from the moment we walked in to the building. I don’t want to spoil anything, should you be about to head there, but yes it was suitably festive given the seasonal theme of “The Night Before Christmas”. We loved sitting in the Gallery; muted pinks and copper/rose gold metallics – like something straight out of a Wes Anderson film. Facilities – fold-down changing table available in the disabled loo, kept immaculately clean. Should you need to change your little one you may need to let one of the team know as it’s a little hidden away. High Chair – A sturdy wooden number, with a table attached and a harness belt. We let them know in advance that we were bringing a baby, so they had the high chair set up for us already. The Food – definitely on the pricier end of the London Afternoon Tea spectrum at £50 a head, £66 if you’re pushing the boat out to have the Rosé Champers with your Tea. The Christmas theme wasn’t overtly apparent in the spread, no turkey or mince pies here, but there are quirky glimmers of festiveness in your surroundings. Perhaps a nod to it in the light and zingy Mandarin & Cinnamon Cheesecake and the Christmas Chai. The Tea selection is modest but has enough range from Jing to keep things interesting. We really enjoyed the finger sandwiches, generously filled and not just slapped between boring bread. I gave Adelyn her first taste of Croque Monsieur (wanted seconds) and Coronation Chicken (spat out). The fruit scones were springy and not too dry. Perhaps a little shy on the clotted cream – loved the fig jam. The Petits Gateaux (of which there are five) were sumptuous but proportioned so as to not be overwhelmingly rich, thankfully. You get a choice between a cheeky slice of fruit or chocolate Battenberg cake to round off your Tea too – you definitely won’t leave hungry. 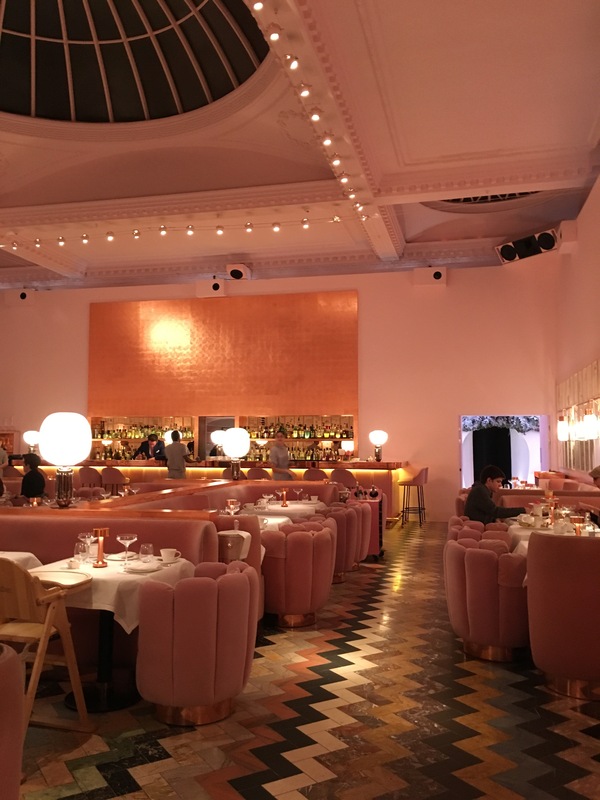 I went in expecting Sketch to be a place to be seen in and therefore perhaps pretentious – but my mum and I were delighted as we found that it was a very welcoming and family-friendly place. Adelyn was the youngest, but we saw other children sitting down for Tea too so we didn’t feel out of place. The team were so accommodating and cooed over Adelyn. To top it off, she received a lovely surprise and was given her very own Sketch teddy bear – a lovely souvenir from her first Afternoon Tea. The only let down for the afternoon was the staff member who was on the cloakroom – I asked her if she could help us take a nice photo by the display there and she just said “No I don’t do that” and turned away – which was astonishingly rude given that there were no other patrons around. A shame that we ended our visit on that note! Bear with me whilst I get my Family Friendly Outing review style down – as an avid (read: greedy) food-lover I often barely remember to take any photographic aide-memoirs on a good day. On this outing I was so focussed on feeding Adelyn/myself, and of course enjoying the company of our friends, that I completely forgot to take enough photos to help illustrate the intent of this category – namely to help give you ideas for where to head out to with the family! When we first had Adelyn, one of the things that I started to miss pretty early on was enjoying the luxury of eating out. Dining out with a little one in tow CAN be fun, but only if you feel relaxed – this is greatly helped along if the eaterie is accommodating towards the needs of a family. Environment: tables are nicely spaced out and there is plenty of room to keep your pram table-side if you so wish. There are steps to get into the restaurant though, but if you let the team know in advance – when you arrive the team will help you use the access lift that’s located in the Tea Building. Lovely and warm, what with the oven-fires going behind the counter – perfect on a chilly day like today. Menu: Good variety of Anti-Pasti, Pizzas, Meat dishes and Salads. Portions are quite generous and the menu has a decent variety without being overwhelming. A Children’s Menu is also available. Great pizza, cooked in their wood-ovens. Familiar favourites (see my pizza above) as well as a variety of toppings for the more adventurous (e.g. Black truffle & cream, prawns & nduja). Facilities: Changing facilities are located in the Disabled Toilet – easily accessible from the restaurant level*. Overall: Industrial interiors never seem particularly inviting if you have little ones running around, but judging from the amount of families sitting around our table and our experience – I would say that in this case, there’s no need to worry. We thoroughly enjoyed the food, buzzing atmosphere and the friendly service from the team there. Feel more like your still-young, trendy-selves and treat the family to a meal out in Shoreditch!